Posted 16 March 2015 & filed under 1980s, 19th century, Life and leisure, Places and spaces, Post World War 2, Railways, Work, World War 2. The Great Northern Railway (GNR) line from St Albans to Hatfield was opened on 16th October 1865 but there had been plans to construct this branch line much earlier than that. Local landowners were encouraged to form an independent company to build the line and the Hatfield and St Albans Railway Company was incorporated into an Act of Parliament on 30th June 1862, with GNR being given the power to work the line. In 1863, in order to build the station in St Albans, land had to be purchased from Lord Verulam. This was not straightforward because Lord Verulam controlled the London Road Toll Bar which lay on the town side of the station. 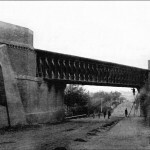 Keeping it there would have meant that railway passengers and vehicles travelling to and from the station would be subjected to the toll, so the railway company wanted it moved further out. Lord Verulam refused. Eventually, the GNR agreed to pay £10 per year to allow free passage for station traffic. The line was not economically viable, however, and the Hatfield and St Albans Railway Company never recovered their costs. GNR then bought the line outright in 1883. Originally, there were only two stations: London Road Station and Hatfield Station. An intermediate station at Smallford (originally called Springfield) was planned but was not ready at the time the line was opened. The journey time from start to finish was only 15mins. In 1880, Fiddlebridge siding and Lemsford Halt were added to the stops on the line and, in 1889, a further intermediate station was opened at Hill End to serve the mental hospital. A siding to serve the Sanders Orchid Nurseries Fleetville was opened in 1890, and it was enlarged in 1904 to transport goods and coal. In 1910 Nast Hyde Halt was opened. Finally, in 1923, the line was extended to link up with the London and North West Railway at the Abbey Station. The line was never very profitable. The busiest traffic was in WW2 when the line was used to transport wounded soldiers to Hill End hospital and workers to de Havilland Aircraft factory. Passenger traffic was reduced after the war and suspended in 1951 although the line was used for freight from then on until it closed in 1969. A few years later, the single-line track was removed but nothing else was done about the track for some time. 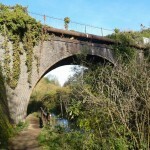 Although British Rail was willing to sell the line for a nominal sum to the St Albans District and the Welwyn and Hatfield councils, the councils were reluctant to purchase it as they would then have the responsibility to maintain the bridges. 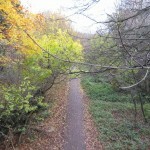 Eventually, in March 1982, the councils were persuaded to purchase the line with the aim to convert it into a footpath and cycle route, part of which is now known as The Alban Way. 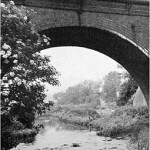 When the line was built originally, the natural landscape around Sopwell had to be altered to cope with crossing the river Ver and the watercress beds. 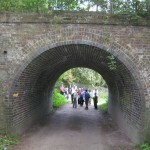 A substantial embankment (25ft) and a brick-arch bridge were constructed, which enabled the line to run into London Road station, and a second smaller bridge crosses over the track leading to the medieval London Road and the Verulam fishing lakes at the end of Riverside Road. The line then seems to descend as the London Road station itself is below London Road. 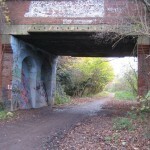 The line continued under the Midland mainline railway bridge which crosses London Road. Walking along the Alban Way today through what is now Orient Close, past the old station building and under the mainline bridge, one can see the extent of the railway cutting. Where is Lemsford Station? I know the whereabouts of all the others mentioned. I wasn’t aware that the line went anywhere near the village of Lemsford. I don’t believe it did, but am quite prepared to be corrected.